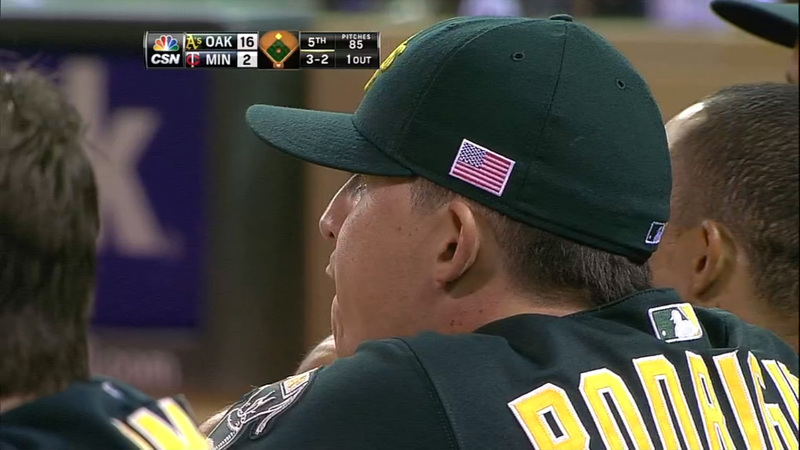 Daric Barton with the flag patch placed right along the back seam of the first panel, right above his ear. Remember when New Era announced that they would be selling the flag patch caps again this year? Upon further inspection, what they are selling is not what the players are wearing. The 59Fifty caps from New Era are the same ones the players wear on the field. That’s how they’ve been marketed to us and it’s true. But for the 9/11 flag patch, it’s a different story. 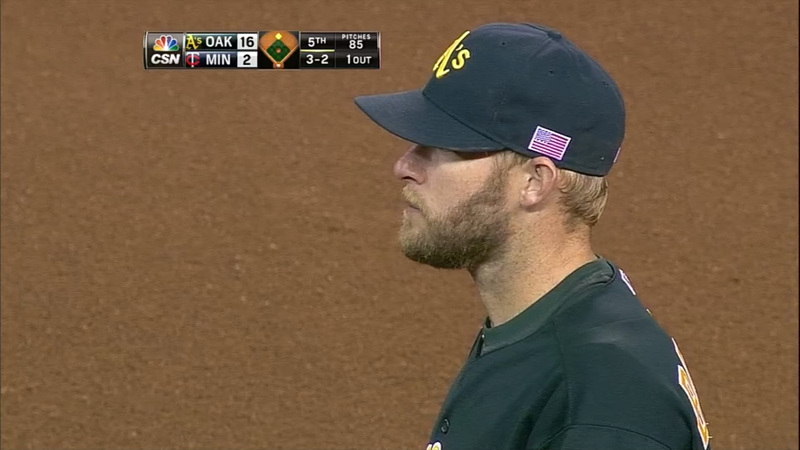 I’ll use screen caps of the A’s game I am watching now. As you can see by the link I have above, the flag is placed in the middle of the first side panel of the cap. But as you can notice by the image above (and around the league), it’s not placed in the middle. Instead, it’s placed all the way to the right of the panel before it hits the seam. The slight placement is minor, but it still makes a difference. 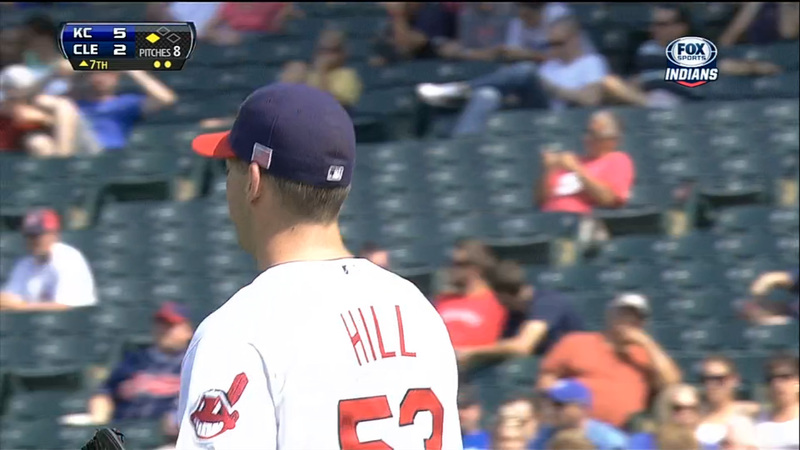 Even when a player wears the old cap design (notice the MLB emblem) they just placed the flag patch on along the back end of the panel. As you can tell, the placement of the flag is in the middle for the ones they are selling. I bought the same cap last year and the placement is in the middle. This is because the caps they are selling are not the same ones they are wearing on the field. The caps that are sold are all brand new caps with the flag patch glued on. In fact, I can bet that some of these are overstocked inventory from last year. For the ones the players are wearing, it appears they simply applied the flag patch onto the caps they have been wearing all season. That’s why the flag placement is different than the ones being sold. (And it’s inconsistent.) It’s because all of them were applied on the day of the game. What’s strange is why the placement is different from the one the players are wearing versus the ones that are being sold. 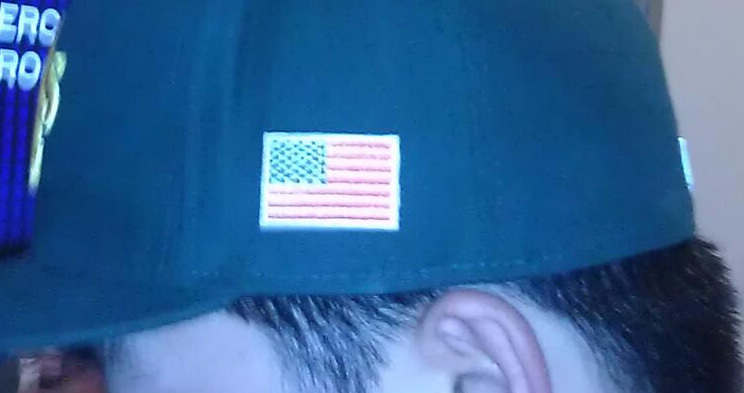 When the players’ version is worn, the ear is directly below the flag. (And if a player has big ears, part of the flag is covered.) The one being sold doesn’t feature that issue as the ear and flag are parallel. What was the reasoning for the different placement? As a consumer, I want my authentic caps to be just like the ones the players wear on the field. But obviously with this, what I purchased is not the same as what the players wear. I understand that it would cost more money for teams and players to wear all new caps for one day today. But if they are going to just apply the patch, why make it so different than what is being sold to the public? And hey, they also applied it to the helmets of the first and third base coaches. 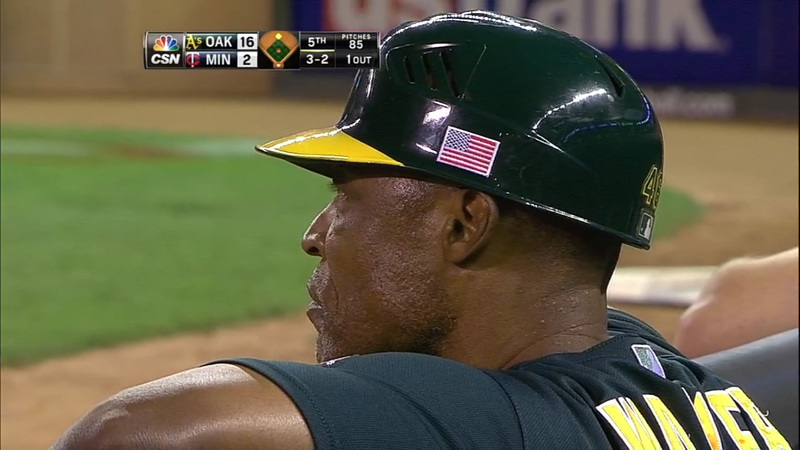 First base coach Ty Waller with the flag patch on his helmet. This entry was posted in Merchandise, MLB, Uniforms & Design and tagged 9/11, Flags, New Era, Patches. Bookmark the permalink.